The FlexArm/FlexCNC team shared its CNC Long Bed Machining industry expertise during seminars as part of the 15th annual Mid Atlantic Machinery Steel Tech Manufacturing Industry Event. Over 500 people witnessed demonstrations of the FlexCNC GRD 20-06 and the FlexArm GH-18 hydraulic tapping arm during the three-day machine tool technology expo at Mid Atlantic Machinery’s Harrisburg, Penn. showroom. FlexCNC president Nick Kennedy “enjoyed the opportunity to share real work opportunities with fabricators and job shops” through equipment demonstrations and question and answer sessions. The presentation covered the practical aspects of machining long parts in a single set-up, or preparing multiple set-ups so that operators can load/unload the machine while another job is running (thus maximizing productivity and profitability). 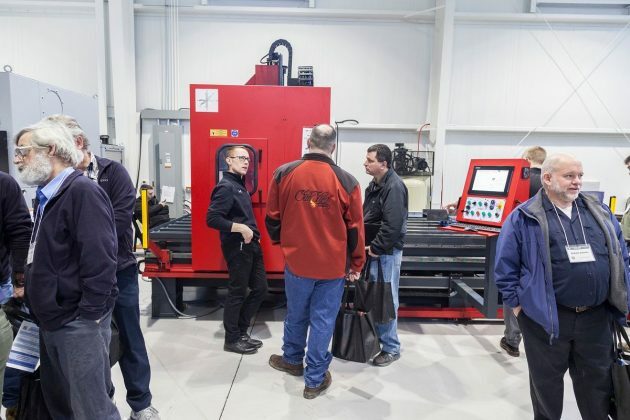 Customers viewed the FlexArm and FlexCNC machines under power, engaged in question and answer sessions with team members, and gained valuable new knowledge and connections to the FlexArm family. As part of its ongoing commitment to training the next generation of manufacturers, FlexArm also set aside time during the expo to focus on education. Approximately 30 students from York County School of Technology listened to Kennedy speak about opportunities in manufacturing. After sharing knowledge about advances in manufacturing technology and careers within in the industry, FlexArm, joined by Mid Atlantic Machinery, donated an A-32 pneumatic FlexArm to the school program for continuing education purposes.